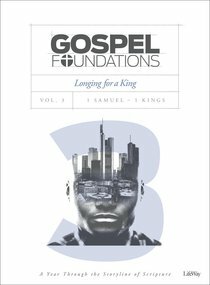 Gospel Foundations, Volume 3 Bible Study Book includes seven small-group sessions, applicable Scripture, "How to Use This Study," and a group discussion guide. A vital component of a group member's discipleship experience, this Bible Study Book includes personal-study activities. The Bible is not a collection of scattered stories and books. From cover to cover, the Bible is the story of God's plan to redeem sinners through Jesus-the gospel. Gospel Foundations tells that story. From the makers of The Gospel Project, this six-volume resource is comprehensive in scope yet concise enough to be completed in just one year. Each seven-session volume includes videos to help your group engage in discussion with a clear understanding of how each text fits into the storyline of Scripture. In Longing For A King, God's people live in the Promised Land, but they are not free. Their rebellion against their Redeemer has led to their oppression. They long for a King to overthrow their enemies and lead them into prosperity. In this volume, groups will learn how God was faithful to provide Kings who would lead His people faithfully. But even the best of these human kings could not overthrow their greatest oppressor-the sinfulness of their hearts. • Understand that even the best kings of Israel still fell short of God's commands. • Learn how the good kings of Israel were a picture of the greater King to come. • Trust that God's promise to give grace to those who turn from sin is true. • Have confidence living on mission because God's rule through Christ will never fail. About "Longing For a King (Bible Study Book) (#03 in Gospel Foundations Series)"